Santa Claus came early in 2013 Topps Strata Football. He was a surprise inclusion on the Signature Relics portion of the checklist, which is otherwise reserved for rookies. The shadow box-style card features a Santa "autograph" -- complete with a gold star -- as well as a festive piece of Santa-worn memorabilia. The first of the 2013 Topps Strata Football Signature Relics Santa Claus cards to surface came during a group break on Cardsmiths Breaks. Such relics are nothing new. Topps has done it several times in the past, although not recently. 2011 and 2012 Triple Threads had American History Relics featuring the likes of Casey Jones, Pecos Bill and Davy Crockett. However, usually these cards came as extra hits in addition to the promised cards. Combine that with better-than-average selling prices and it's tough to complain about them. Not so with Santa. Cardsmiths Breaks owner, Sam Smith, said that the Strata Santa was the lone Signature Relics card during the case break. Signature Relics are considered a case hit. "I think that was the worst thing about it," said Smith. "It would have been best as an extra hit." He said the reaction was mixed among those during the live break. "Some people were like 'What the heck?' Others said how much their kid would love it. We had fun joking about it," Smith said. The card, which is numbered to 35, was given away at random to the participants in the break. Christmas cards are nothing new in the world of sports cards. Santa Claus has a bit of a history in the hobby, particularly when it comes to short print chase cards. He was featured on a handful of popular Pro Set cards. In fact, the 1989 Pro Set Santa Claus still commands a solid amount. In the mid-1990s, card makers and NFL Properties teamed to make Christmas-themed mail-away sets. Many of these had Saint Nick. In 2007, Topps made a small box set that placed Santa Claus on various baseball designs. The affordable set also comes with an autograph and memorabilia card. 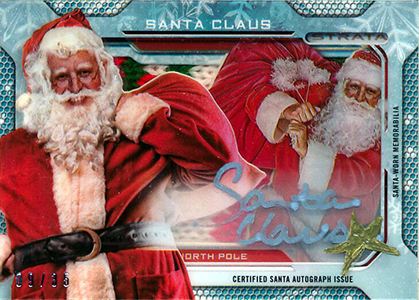 What's your take on the 2013 Topps Strata Santa Claus card? Would you be happy to pull it, even if it replaces a case hit? Santa Claus Set Of Baseball cards, Campbells Soup, & Coca Cola Trading Cards..
1990 Pro Set SANTA CLAUS SP NNO MERRY CHRISTMAS!! 1992 Pro Line Portraits SANTA CLAUS Auto Autograph Card 500 w Stamp SP Rare! case hit for a $700 case? I don’t think id be very excited.. what about collectors that don’t celebrate Christmas? Agree w/emeeks. But not being ‘very excited’ is a huge understatement, I’d be livid and would give pause to ever buying the product again. Given this years draft class is relatively weak to begin with, does Topps seriously expect true hobbyists to be pleased with an auto/memorabilia card of a non-existent being in lieu of a marginal player who may (or may not) sometime down the line emerge into a star? There’s a Nassib shadowbox currently on ebay sitting @$7.50 wish slightly under a day and a half remaining – I wouldn’t be all that thrilled had I pulled it as my case hit, but at least there’s the potential of an upside to his career. Santa on the other hand… thanks Topps, I really appreciate another lump of coal this Christmas. ^what they said. I wonder which intern they made sign the cards..
You say you would be livid. You would be until you sold it on ebay for 1000. Then you would feel pretty good about it. Cool card for long time hobby collectors. i won the card featured. I think the gold star is even more rare, i have seen two other of the claus auto’s on ebay and neither has the gold star like mine. maybe only first 10 feature a gold star. Has anybody seen the rivet santas? Willing to pay 200 for one. Hobby Box - 2013 Topps Strata Football Cards FACTORY SEALED!